Britain’s biggest buses will be going into service next month, operating on two key routes in Edinburgh. 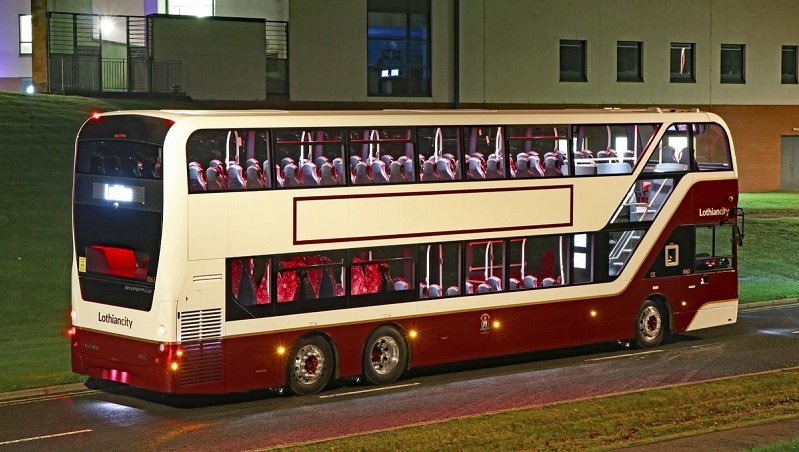 Lothian Buses’ new 100-seatAlexander Dennis Enviro400XLB-bodied Euro VI Volvo triple-axle double-deckers will begin operations on the city’s services 11 and 16 from early March. They are Edinburgh’s two busiest bus routes, with a total of more than 10 million passenger journeys recorded in 2018. Lothian Managing Director, Richard Hall, said: “The city is changing and public transport operations must evolve to meet the growing needs and expectations of our customers. Core cross-city routes are an important piece of our network, transporting millions of customers quickly and efficiently to their destinations every week. “Services 11 and 16 are high frequency core route services, with high demand in the morning and afternoon peaks, as well as at weekends. By deploying these new vehicles on to these services to cope with customer demand patterns, we will be able to change how we deliver [them] for the benefit of our customers and the areas in which we operate. The 42 Enviro400XLBs are able to carry up to 129 passengers in total, 100 of which are seated, and have separate entrance and exit doors to speed up dwell times at bus stops. They have high-backed seating, Wi-Fi, USB charging, mood lighting and audio-visual stop announcements.